Almost every job requires workers to use verbal communication skills. That’s why verbal skills are highly ranked on the candidate evaluation checklists used by many job interviewers. The stronger your communication skills, the better your chances of getting hired regardless of the job for which you’re applying. You’ll do better during the interview, as well as on the job. Effective verbal communication skills include more than just talking. Verbal communication encompasses both how you deliver messages and how you receive them. Communication is a soft skill, and it’s one that is important to every employer. Workers who can convey information clearly and effectively are highly valued by employers. Employees who can interpret messages and act appropriately on the information that they receive have a better chance of excelling on the job. What constitutes effective verbal communication on the job depends on the relationships between communication partners and the work context. Verbal communication in a work setting takes place between many different individuals and groups such as co-workers, bosses and subordinates, employees, customers, clients, teachers and students, and speakers and their audiences. 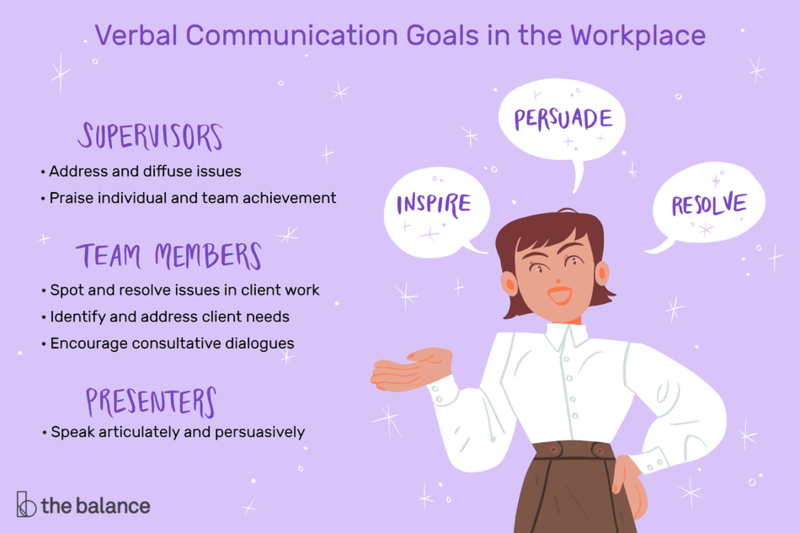 Verbal communication occurs in many different contexts including training sessions, presentations, group meetings, performance appraisals, one-on-one discussions, interviews, disciplinary sessions, sales pitches, and consulting engagements. Here are some examples of effective workplace verbal communication skills employed in different workplace contexts. Verbal Communications for Supervisors: The best supervisors don’t merely tell their subordinates what to do and expect them to listen. Instead, they employ active listening skills to understand employee needs and perspectives, engage in verbal negotiation to address and defuse issues, and capitalize upon opportunities to praise individual and team achievement. Verbal Communications for Team Members: Open and constant lines of communication are vital to team success, particularly when completing quality- and deadline-critical projects. One of the most important team-building skills, strong verbal communications help to ensure that issues will be spotted and resolved in formative stages, averting costly escalation. Verbal Communications with Clients: If a large part of your work involves one-on-one communications with customers, it’s helpful to have a “gift of gab” – particularly if you are a sales professional. Keep in mind, though, that your conversations need to be focused upon identifying and addressing your clients’ needs; using your verbal talents to encourage consultative dialogues will ensure positive client relations. Noticing non-verbal cues and responding verbally to verify confusion, defuse anger, etc. Even if you are a shy introvert who prefers to work independently, there are ways to improve your verbal communications skills so that you can more easily cultivate rapport with others. Practice makes perfect, and so take the time to actively practice these communications skills for workplace success: active listening, clarity and conciseness, confidence, empathy, friendliness, open-mindedness, giving and soliciting feedback, confidence, respectfulness, and non-verbal (body language, tone of voice, eye contact) communication.